Review: I was drawn to this book because, well, I’m a sucker for long and elaborate titles. Fortunately, my love for long titles did not lead me astray. Frenchie Garcia’s obsession with death is a very real one — she lives on the down the street from a cemetery. But, as the book progresses, it becomes clear that her preoccupation with death is not only caused by her locale. The death of her classmate Andy Cooper occupies her thoughts and takes a toll on her relationship with her closest friends. 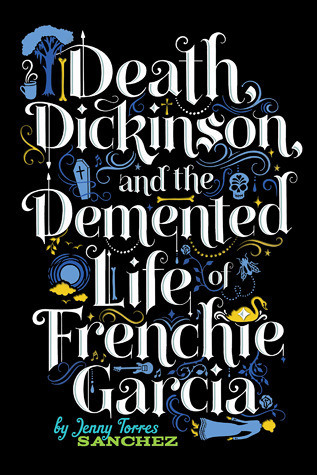 Death, Dickinson, and the Demented Life of Frenchie Garcia reads more like a mystery than anything else. The story of Andy Cooper’s death and Frenchie’s role in it is slowly revealed as Frenchie’s life unravels. Bits and pieces of Emily Dickinson’s poetry help take Death, Dickinson, and the Demented Life of Frenchie Garcia to the next level. Frenchie loves Dickinson’s poems and finds comfort in her one-sided conversations with Dickinson. Each poem in the book gives meaning to Frenchie’s experiences. It’s also a great crash course in Dickinson’s poetry if you’re not familiar with it. The book’s strongest point is the portrayal of Frenchie’s relationships with her close friends and parents. Even though the book is from Frenchie’s perspective, you can really get a sense of what her friends think of her and how they treat her. Frenchie’s emotional turmoil leads her to sabotage her own friendships, but they hold strong. Still, Death, Dickinson, and the Demented Life of Frenchie Garcia is an interesting reflection on death and those it affects, as well as the strength of friendship. Recommendation: Get it soon, especially if you’re a fan of Emily Dickinson!